Welcome to the JMJ Ministries Website! The mission of Jesus Mary and Joseph Ministries is to serve the community of Tucson, Arizona and beyond with the presentation of faithful Catholic spirituality, prayer and education by providing a center for Catholic outreach and evangelization in obedience to the prayer of Christ our Lord. John 17:21 "...that they all may be one as you Father are in me and I in you that they also may be in us that the WORLD may know that you sent me..."
This is only possible through the intercession of the Blessed Virgin Mary, who is the patroness of this Ministry along with Saint Joseph, Saint Anthony and the guidance of the Holy Spirit. 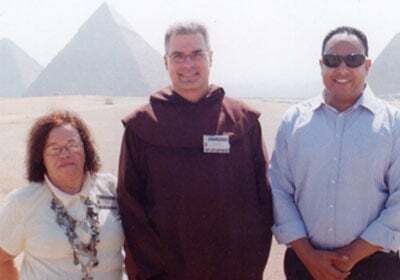 JMJ Ministries ia committed to providing guided pilgrimages (not vacations) to spiritual destinations all over the world including: Egypt and the Holy Land, Itay, Rome, Medjugorje, Fatima, Lourdes, France, Poland, Germany , Czech Republic, South America and numerous other destinations chosen by our Priests.. 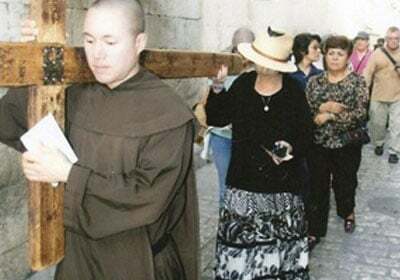 These pilgrimages are to benefit our Priests and lay people. This is only possible through the intercession of our Blessed Mother, under the Title of Rosa Mystica, Patroness of Priests and Religious as well as her spouse Saint Joseph. We are in the process of scheduling pilgrimages for 2017-18; you can view our current itineraries here. The ministry also offers a complete religious store, which serves as a social hub for community news. JMJ Ministries is in the process of expanding its outreach through the creation of a community outreach center. 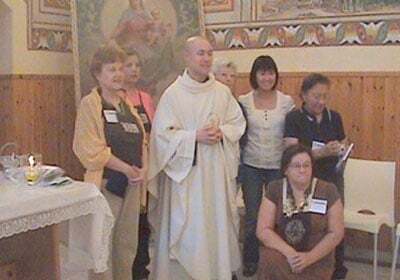 This center is an important step in the spiritual and social growth of this community, which is very small and poor. A facility like this does not currently exist in Tuscon or the surrounding area. JMJ Ministries is seeking your help to make this center a reality. View our Objectives here. JMJ Ministries is working to touch the lives of our community in a positive way, sharing in the blessings and graces given by the mercy of Our Lady. If you would like to volunteer, donate, join us on a pilgrimage, or have questions about our ministry, please feel free to reach out to us online, via phone, or in person. We look forward to speaking with you. This was designed by Paula as she undertakes her new position in the ministry. We are making T-shirts with it on them to call attention to everyone that Rosa Mystica is the patroness of the Clergy, especially our Priests. The logo was designed to show the first two apparitions at Montichiari, Italy. The first was in the Spring of 1947 when praying in the chapel of the local hospital a nurse by the name of Pierina Gilli had her first unforgettable experience with the Mother of God. In this first apparition she saw Her heart was pierced by three swords; the first sword means: the unworthy celebration of Holy Mass and Communion unworthily received; the second sword is: being unfaithful to, and giving up, the vocation as a priest or a religious; and the third sword means: betrayal of the Faith. She asked for “PRAYER, SACRIFICE, and PENANCE.” The Second Apparition on the 13th of July, 1947 Our Lady was in a white dress and adorned with three beautiful roses: white, red, and yellow which replaced the three swords. The white rose represented the spirit of prayer, the red one the spirit of sacrifice, and the yellow rose the spirit of penance and conversion. Because Rosa Mystica is our patroness, we wanted to be able to call attention to this powerful apparition, and this is what was designed to show it. We are very grateful to Paula for using her talents for this ministry.